#5. We are currently picking out things for our house (as we will be for the next several months), and on the list right now is a front door. I, being the visionary that I am, had the perfect door picked out in my mind's eye. I found it here, with seeded glass...perfection. Then we get it priced. I wonder...How can the glass cost MORE than the actual door? #4. I love my children. I do not always love the tornado-esque mess they leave trailing behind them. I wonder...Why do I even bother picking up the house? #3. I really want to get back into shape. Not scary muscle woman who looks like muscle man shape, but fit. Lean. Strong. Like I felt before children. I wonder...Will I have the willpower to stick to it? #2. I just ordered the Bug's birthday invitations yesterday. We're having a cupcake themed party. "Cupcake" was her nickname while I was pregnant. I wonder...Where has the past year gone? #1. My Monkey has taken over the remote control. He can navigate to practically any cartoon channel we have. Scary, yes. A bit embarrassing for me, even more so! I wonder...Who snuck into my house and taught him this skill, or is it an instinct all men possess? Hope you guys have a great weekend! Oh, and feel free to share what you're wondering. OMG those invitations are too freaking cute! 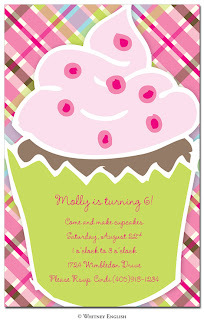 I just heart those cupcake invitations super cute! They have these cupcake aprons for mommy and daughter for cupcake parties I think I seen it on Kelly's Korner if I find it I will give ya the site!! Those two kids of yours are so adorable!! You're one lucky lady. Love hearing your stories! Something about men and remotes...it's innate! Carlie had a cupcake theme party to for her 1st Birthday! I know it will be cute!